Even vegetarians and vegans who don't generally like mock meats quickly discover that they are big fans of vegan chicken substitutes. Similar to chicken, mock chicken and soy vegan chicken take on almost any flavor, and have a pleasing texture. From crispy, fried soy chicken nuggets to traditional Chinese dishes, going vegetarian (or vegan) doesn't have to mean giving up some of your favorite poultry recipes. It's no secret that deep-fried anything is usually delicious, and truth be told, these deep-fried Southern-style vegetarian "chicken" nuggets made from seitan are out-of-this-world good. Even the staunchest meat-eaters will approve of this recipe. Just be sure to maintain a medium-hot oil temperature—otherwise, your nuggets will be burnt and brown instead of crispy and golden brown. Since Asian cooking rarely includes any dairy, by simply swapping out the meat for tofu you easily have a vegan dish that tastes truly authentic. This recipe includes all of the flavors of kung pao chicken but with tofu as the prime protein. The tofu is pressed, marinated, and baked, and then stir-fried with the vegetables and flavorings. Soy-based vegan chicken nuggets are relatively low in fat and healthy enough to eat every day. The tofu pieces are tossed in a mixture of soy milk, mustard, nutritional yeast, and spices, coated with panko breadcrumbs, and then pan-fried until golden. 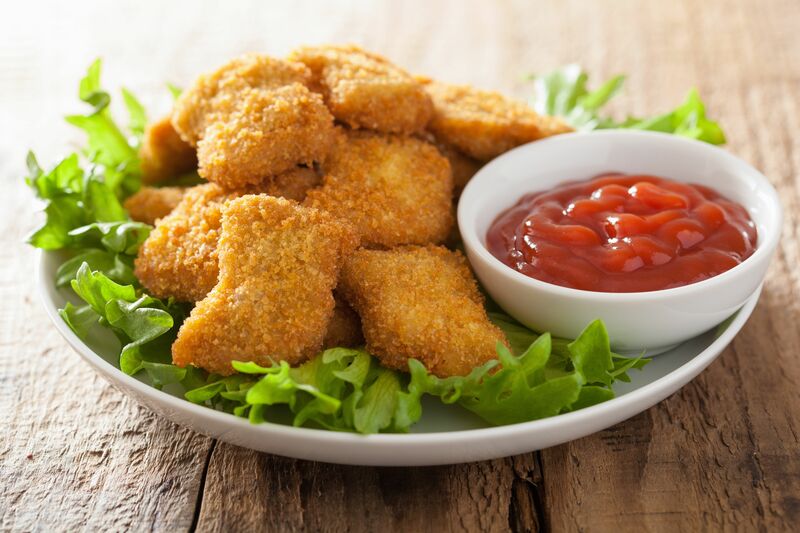 Kid-friendly tofu nuggets are reminiscent of chicken nuggets and can be dipped in ketchup, barbecue sauce, or ranch dressing (if not vegan). This vegetarian tofu version has all of the same sweet and tart flavors of this traditional Chinese chicken dish. The tofu is sauteed with garlic and then cooked in a mixture of soy sauce, orange juice, rice vinegar, orange marmalade, and ginger until the sauce is nice and thick. Perfect served over rice. You could also try this recipe with chunks of fried seitan for a chewier vegetarian faux chicken recipe. 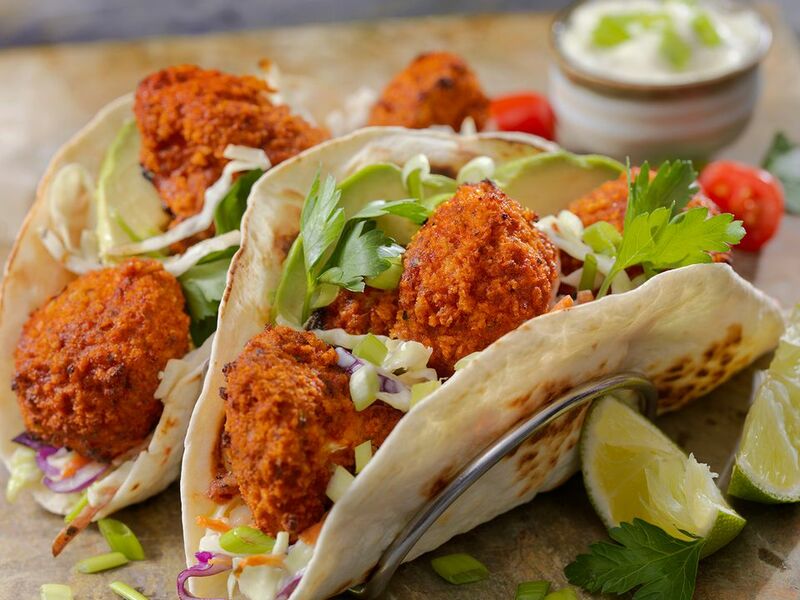 Vegetarian Buffalo wings can be prepared in much the same way as when using real chicken. The chicken substitute seitan is coated with spices, fried, and then tossed with margarine and spicy hot sauce. These vegetarian Buffalo wings are nice and messy, just like the real thing, so serve with plenty of napkins! You can also make this dish using tofu. Made with vegetarian chicken-style deli slices, this soy chicken salad recipe is full of flavor and looks gorgeous served on a bed of crisp green lettuce—but it is also perfect between toasted bread or a soft roll as a sandwich. The combination of carrot, celery, green onion, relish, and dill bring tons of flavor to the salad and the (vegan) mayo makes the mixture nice and creamy. For a vegetarian main dish, try this pot pie recipe filled with vegan "chicken," vegetables, and savory herbs. You'll find it's just as hearty and filling as any other pot pie, yet much lower in fat since it does not contain any cream. To make vegan, use a vegan puff pastry or another type of vegan crust. When you're in the mood for pizza but need something with a little more heft, it doesn't get much better than this barbecue "chicken" wing pizza, made with store-bought vegan barbecue chicken "wings," barbecue sauce, and mozzarella cheese, and garnished with fresh chopped cilantro and a squeeze of lime. Substitute dairy-free cheese and pizza crust for a vegan version.